According to Hudson and Nicholls’ Directory of Museums and Living Displays, the Bear Gardens Museum was in a Georgian warehouse standing on the original site of the Elizabethan bear baiting arena and the Hope Playhouse. Its displays illustrated the history of 16th and 17th-century playhouses, and included scale models. 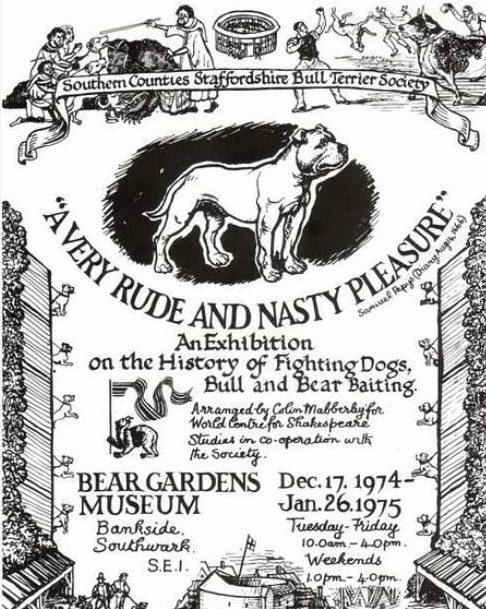 As Bankside was on the south bank of the Thames and thus outside the jurisdiction of the 17th-century city of London, it was a popular site for all manner of entertainments including bear baiting and theatres. Shakespeare’s Globe theatre famously made its home there in 1599. I wonder who is your wife. From 1978, the Museum was run in association with the ILEA, as the Bear Gardens Museum and Arts Centre. The two people most closely involved with running it were, first, Julie Eaglen, second, Jenny Naish.